This is not democracy, for majority do not subscribe to it. This is not socialism, for the taken money is not distributed to the needy. What then is this new fanged atrocity? It sparks in me an extreme level of disgust and anger at the injustice of it all..and every time I read or hear about it. It is disgust at the perpetrator of the crime and disgust for all those masses who revel in it. I have nothing against anybody calling themselves a dalit or of scheduled castes/ tribes. I lived all my life in a city and only in very exceptional cases, knew the castes to which my friends belonged. While the evils of untouchability have eluded my direct contact, I can understand that they still continue to a large extent in rural India. All newspaper reports cannot be fabricated. In that sense, I see why those people even after 60 years of independence need separate constitutional laws and special concessions. But, aren't those who support Mayawati's insufferable atrocities a little too pea-brained to deserve sympathy? Yes, educated people see the fallacy of allowing someone to spend 2000 crores on building ugly monumental statues, statues of herself, scores of statues of rows of elephants, statues of people who have not done much to help any mankind, statues of thieves...These thieves are not only thieving from taxpayers, but also from the very "depressed classes" who applaud her, and alas too narrow minded to even realize that.The fact that dalits of UP still vote en-masse for her is testimonial to this fact. This picture appeared in the Washington Post and the UK telegraph as well. What irks me is that these people fail to see that the money designedly to "claim the dalits' rightful space in the society" could well be used in a manner that could give them a more respectful and untainted space. I am at a loss to understand why they do not stand up to demand good schools, good rural hospitals, good sewer systems and electricity and water supplies to their forgotten lands. Will that not empower them to be as good as the "city sahibs"? As if her monstrous statues are not enough to defile the city, she also needs to create a special police force to guard them? How about a special police force for a corruption-free vigilante? Or how about a special police force for people only? Even while the supreme court and the home minister rebuked her, she tacitly replied that it would be a further waste of all the money to now remove/ abandon all the statues...How true! How unfortunate! How distasteful!The feeble attempt to petition to the election commission is going to have even more disgraceful outputs. But, can one file a petition to disallow obvious thieves from contesting in elections ever again? Is a mass awakening possible? Can all tax-payers file a robbery case against this tyrant? After all, aren't they now the oppressed classes of the society in this new era? It is no secret that all these gimmicks are politically motivated, with a self inflicted sense of ugly royalty. 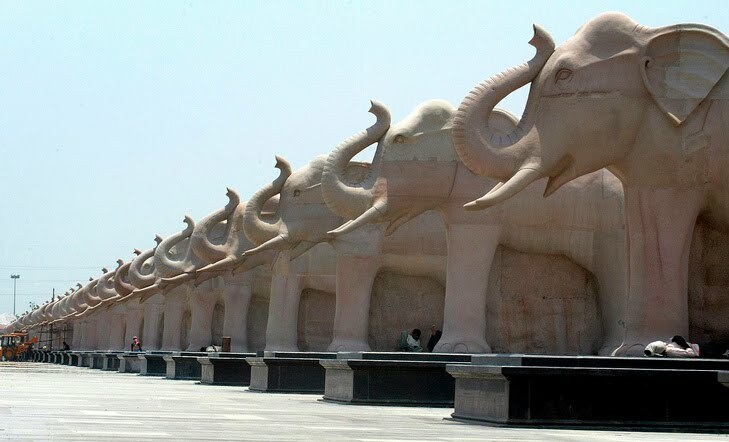 How else do you define the fact that the Ambedkar Park is having so many elephants? 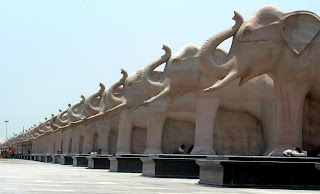 Did the great leader have an affinity for elephants? Or is it just another advertisement of Mayawati’s political symbol? However, I disagree with the statement that the ‘masses are too pea-minded to deserve sympathy’. They are kept in a state of blissful ignorance in order to make them believe that the leader, in this case Mayawati, is a demi - goddess. No fault of theirs. Anybody can mesmerize and misguide a bunch of uneducated masses. Q - What if Lalu, Jaya, Maya, Soren, Gowda etc., were on the same boat and all of a sudden the boat collapses in the middle of the sea? Sheer nonsense i would say.. fed of these murky politicos. both og you are right. @ Priyank: I might be too harsh on those people I agree, but I cant stand it that they are so brain washed to see that what should be rightfully theirs is going to something wasteful. Mayawathi is part of system . Dont make her scapegoat. Indira failed at Oxford’s Somerville College. She couldn’t clear Latin twice though she had crammed six months for it. She was advised to take up a diploma instead of a degree, but she dropped out of college at 22. Rajiv went to Trinity where, he couldn’t pass his mechanical science degree, failing after three years. Sanjay Gandhi could not even pass high school, dropping out to become a mechanic. @ Manjunath, Mayawati is by no means the only cause for shame, but she is one too. She is an example of our imbecile politics.